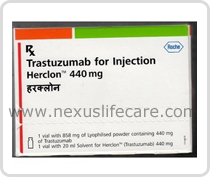 Herclon 440mg (Trastuzumab) injection distributors, dealers & suppliers in Mumbai. Uses:- This Injection is used to treat certain types of breast cancer and stomach cancer, and is being studied for other conditions as well. Herclon 440mg (Trastuzumab) injection is a type of immunotherapy known as a monoclonal antibody. A monoclonal antibody is a man-made version of an immune system protein that fits like a lock and key with one certain protein.Herclon 440mg (Trastuzumab) injection is designed to seek out and lock onto a protein called human epidermal growth factor receptor 2 (HER2), which is located on certain cells in the body.